I am so excited about our new welcome packets. They are really cute and a great way to get clients excited and informed. Plus, I am big, HUGE believer in presentation and providing a quality experience, not JUST a quality product. We want the entire process, of working with us, to be enjoyable and memorable. As promised, I want to include some blog posts for my fellow photographers, so this will likely be more for you. However, if you are a new client, of ours, here’s a little preview of what you’ve got coming your way (and there is a question for you at the end). First, I want to give a shout out to some amazing companies that made this all possible. I’ll reference them again, as we go, so you can see specifics. Design Aglow (An AMAZING company for photographers with SO so many resources. Take my word for it. If you’ve got a photography business, you’re going to want to check them out! I used their Modern Minimalist templates. As I mentioned above, my folders are a recycled 2 pocket folder from Amazon. There are several companies that sell these folders and, honestly, I am not totally sold on this particular one. The pockets are a bit shallow. They still hold everything, but I can see a possible change in folder distributor, in the future. I do love that they are a recycled product. Photographers use A LOT of paper, so being able to use recycled products, whenever possible, is a big bonus. It is a common occurrence that clients and their families assume the photographer is a day-of wedding coordinator. I really don’t have the qualifications for this and honestly, I am so focused on capturing the day, I am not really thinking about keeping the day organized. In fact if you are in need of a day-of coordinator, I recommend Jessica Ann. But, since it does often happen that we are, unofficially, placed in that role, I wanted to include some helpful planning tools. Inside the folder, clients will find a welcome letter (design aglow template) and a sample wedding timeline (designed by me) as well as, the cutest little pocket wedding planner you have ever seen. This Design Aglow Modern Minimalist template is a checklist of everything you need to do for planning a wedding organized by the time period, by which to complete each task. It starts at 9-12 months out from the wedding date and continues until the big day. It is printed on an accordion booklet from Pro DPI and I was amazed at the quality of this product. The front and back cover are thick hardback panels and it comes complete with a little black elastic band to keep the book securely together. This might be my favorite piece of the whole packet. Except, I also LOVE the feel of my welcome letter. I used White House Custom Color to print this piece because, although Design Aglow works with Pro DPI and designs their templates to match Pro DPI products (super convenient), I am really crazy about WHCC’s soft touch matte paper. It feels so luxurious. I think I could sit there and rub this paper through my fingers all day. I am usually a huge fan of very textured papers so for me to love this oh so smooth one means it must really be good ;) I almost always recommend it to my clients for their invitations because everyone loves it. My two accordion guides, designed using Design Aglow’s minimalist welcome packet templates, are perfect for informing my couples of lots of information in a simple, easy to follow, form. In the first, there is a section for grooms, studio policies, first look information, etc. all in one guide. 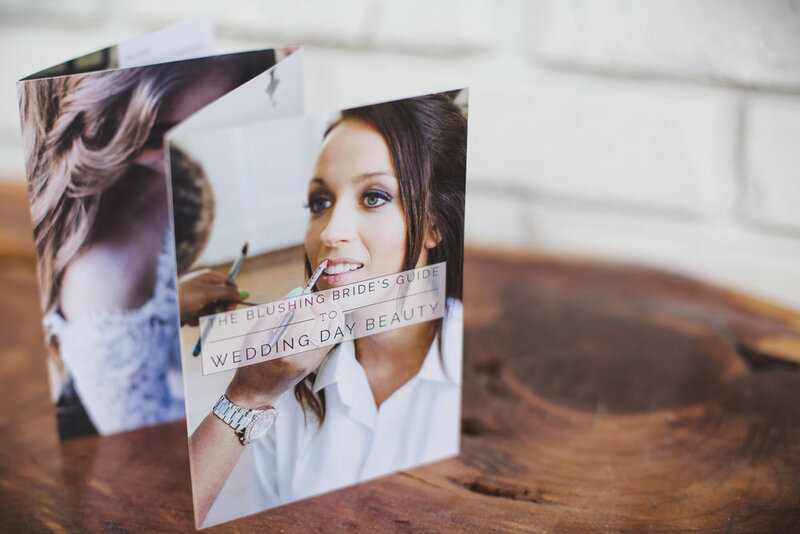 The other is a bride’s day-of beauty guide with tips and tricks from a photographer’s perspective. It talks about the way light reflects and how things tend to show up on the camera. It is so helpful and my favorite part of this guide is my coupon for a free consultation with the amazing Alexis Brannan! She islicensed cosmetologist & makeup artist and bridal specialist AND is fantastic! I also included a guide for our engagement sessions. Though I don’t normally have to convince couples to do these (because, as we all know, engagement photos are the bomb), it does discuss how important and impactful they are. Most of my packages include one already, but I want my clients to know that just like their wedding photos, engagement photos will last forever and be something they will always love looking back on. Plus, we can do SO much with those engagement pictures from thank you cards to guest sign in books at the wedding, to big gallery canvas prints displayed at the reception and everything in between. Finally, I have a preferred vendors list and my product inspiration catalog. Couples usually book their venue and then, their photographer. They do this really quickly and everything else tends to follow slowly. For this reason, I wanted to include a list of some vendors that I think are really great. Because I am still learning about the vendors in my area (I used to be located elsewhere) I am, currently, just printing this guide at Office Depot on their cardstock. In the future, I plan to include more info from vendors and have a front and back cover on the guide. My product catalog is such an important part. I don’t require my clients to print from me, but I do truly believe that the quality, of the products, we provide is the very best out there! This guide shows a sampling of what we offer. Not everything is shown, but I plan to add more in the near future. Check out some of these products, from Acurated Home, here. Okay… and now for my stamp. This wonderful stamp was created by SayaBell Stamps on Etsy. It is exceptional quality and shipped really quickly! I adore hand stamped products. I think the fact that no two are exactly the same adds really good character. And, of course, it feels so authentic- because, well… it is. And... that's it. They do take some time to put together, but oh SO worth it, in my opinion. Photographers, have something you LOVE putting in your welcome packets? Brides/Grooms, have something you'd love to get in a welcome packet? Let me know what it is in the comments down below. I'd love to hear from you! !